Volunteers celebrate a successful weed pull day. Thank you to all attendees and partnering organizations, for making our 2019 training series a success! 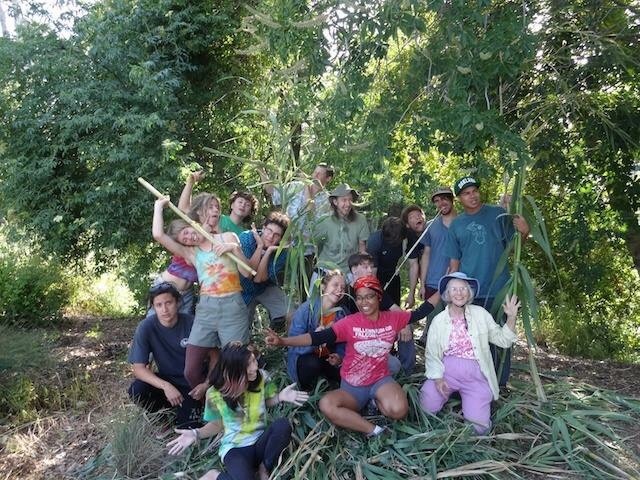 We hosted a 10 training sessions for volunteers in invasive plant management, including training sessions with local civic corps organizations in the Bay Area. Topics included: invasive plant biology, control methods, restoration strategies, tools of the trade, mapping using Calflora, and more. Join our WVN mailing list (above) to get notices about the 2020 schedule. Are you working on a volunteer project to address invasive plants? Please add your organization and site(s) to the map! (Just click on the map below to get started.) Volunteer groups have begun adding their invasive plant management projects to an online map, with brief descriptions of the project. This allows volunteers to see what efforts are going on near them and who else is working on particular plants of concern. Instructions for adding your projects to the Wildland Volunteer Map!